Hundreds of thousands of Yemenis march in support of a new combined governing council immediately rejected by government based in Aden and UN. Sanaa, August 20, 2016. (AP Photo/Hani Mohammed). All rights reserved.Following the collapse on August 6 of the Kuwait negotiations between Hadi’s internationally recognised government in exile on the one hand and the Huthi-Saleh alliance on the other, diplomatic activity to bring the war to an end has notably increased, particularly on the part of the external actors. How serious are their efforts? Will they achieve anything? Meanwhile the living conditions for Yemenis continue to deteriorate. It is, however, sad to note that the situation has finally come to public attention not due to concern for Yemen or Yemenis, but rather as a means to attack western states for their relations with the repressive Saudi Arabian regime. This pressure has not prevented more sales and the US announced last month the sale of 153 tanks including ‘twenty battle damage replacements for their existing fleet’. Outcries about weapons sales have led to the Netherlands and EU decisions to stop them. In the UK the Campaign Against the Arms Trade has achieved a judicial review against the Government’s decision to continue arms exports to Saudi Arabia which is likely to take place early next year. This was partly thanks to the considerable evidence that many of the civilians killed and wounded in Yemen by the Saudi-led coalition’s airstrikes have been hit by British manufactured weapons and ammunition in violation of international humanitarian law. Similar pressure has come from some US Congress representatives in Washington, which may explain the withdrawal of the majority [40 out of 45] of US personnel from the ‘Joint Combined Planning Cell’ established at the beginning of the Saudi-led offensive. Given that US and UK military personnel were widely described as helping to ensure accurate targeting, their competence and the quality of their advice are now questionable after the destruction of four MSF-supported hospitals, hundreds of other medical facilities and schools, as well as food processing factories and food storage belonging to private companies, the public sector or, indeed, humanitarian organisations. The UN have just upped their death toll to over 10,000 but this, again, only includes recorded deaths in medical facilities, ignoring those elsewhere, let alone all those dying from lack of medication or treatment for chronic disease due to the shortage of medicines resulting from the blockade. Shortly before the end of the Kuwait talks, Sana’a witnessed an important and worrying development. The Higher Revolutionary Committee set up by the Huthi as the top ruling institution in the country in early 2015 was formally replaced by a Supreme Political Council composed of 5 senior Huthi and General People’s Congress Saleh supporters each. In theory, the establishment of this council ends formal Huthi control and replaces it with an institution jointly loyal to the Huthi leadership and Saleh. This indicates a weakening of the Huthis within the alliance. In plain English, as the GPC members of this council are 100% loyal to him, Saleh is now explicitly back in the driving seat and controls at least half of the decision-making body in the area controlled by their joint forces, an area which may represent no more than 25% or so of Yemen’s surface, but well over 60% of its population. However implementation of this change is faltering, and the Revolutionary Council is still functioning, demonstrating Huthi resistance to Saleh’s pressure and continuing uncertainty about the balance of power in this unholy alliance. Air strikes killed at least three people on the margins of this truly vast demonstration, only comparable to the largest demonstrations of the 2011 popular uprisings. 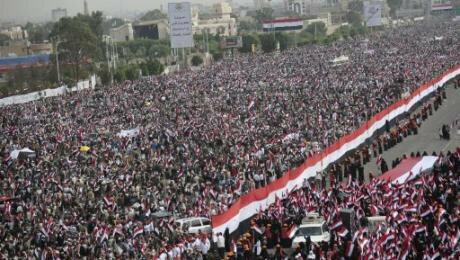 Despite this, war weariness and opposition to the Saudi-led coalition bombing have ensured popular support, as shown by a mass demonstration on 20 August in Sana’a, when well over 100 000 people came out despite coalition aircraft threatening overflights; air strikes killed at least three people on the margins of this truly vast demonstration, only comparable to the largest demonstrations of the 2011 popular uprisings. While some certainly turned up under pressure from Saleh and the Huthi leadership, there is no way that this could explain such a turnout. The internationally recognised ‘legitimate’ government of president Hadi is officially in control of all the area of the former People’s Democratic Republic of Yemen, and some parts of north-east Yemen including Mareb, where many troops are based. A few ministers operate from the officially designated temporary capital of Aden, while the majority are in Riyadh or on various international jaunts. The Prime Minister has spent only 45 days in Aden since his appointment in early April, while President Hadi himself has spent all of 87 days in Aden since its liberation at the end July last year, and has not set foot there since mid-February this year. Moreover, the legitimate authority’s control of the areas it claims is debatable: with respect to Aden, there is little doubt that ministers’ absence is largely a self-preservation measure, given that suicide attacks are a daily occurrence in the city, the latest major one on August 29 killed over 70 young men signing up for recruitment to join the forces protecting the Saudi borders from Huthi-Saleh incursions. Attempts and actual assassinations of political and military leaders are frequent, electricity and water supplies are irregular and are dependent on emergency equipment brought and financed by the United Arab Emirates forces. Much of the rest of the southern governorates is run by local community leaders, whether tribal or other, extremely few of whom claim any allegiance to Hadi or his government. They are either waiting for a credible government or they support southern separatism, which Hadi firmly rejects. While claims that jihadis [whether Al Qaeda or Daesh] control much of this part of the country are largely incorrect as they have been driven out of most villages and towns where they used to dominate the political/military scene, they do have a presence. Unsurprisingly, the end of the Kuwait negotiations have resulted in a substantial increase of Saudi-led coalition air forces airstrikes throughout Yemen, both in number and targets, with over 100 airstrikes on some days. Plenty more examples can be given. But basically the military stalemate and pointless killing continue. Sana’anis who had lived for a full 5 months without strikes are now being bombed daily, with the same sites hit again and again: if any weapons are still stored in those mountains, they are obviously out of reach. Ta’izz city and governorate continue to be torn apart by ground fighting and airstrikes. The same situation prevails on the usual fronts [Nehm about 60km east of Sana’a, the Saudi border. A new development has been direct strikes on southern areas said to shelter Al Qaeda or Daesh militants, where previously only US drones were active in those areas. Targeting is as efficient as ever, with the fourth MSF hospital destroyed on 15 August in Abs, on the plain of Hajja Governorate suffering the highest death toll of such strikes, (19 dead and 24 injured), only two days after a school had been hit in that governorate, killing at least 10 children. Plenty more examples can be given. But basically the military stalemate and pointless killing continue. The Hadi government in exile is trying alternative tactics to bring the Saleh-Huthi opposition to heel. These come in two forms: the widely denounced blockade which prevents basic fuel, food and medical supplies from reaching the population, has resulted in the current situation with over half the population ‘food insecure’, and 7 million suffering severe food insecurity, ie close to starvation. Remember that Yemen imports 90% of its wheat and 100% of other staples such as rice, tea and sugar. Hence the blockade which is widely denied, but actually enforced, plays a major role in worsening the humanitarian catastrophe. In Yemen, as in so many other wars, basic human needs are used as weapons by the warring factions. In the current situation… over half the population [is] ‘food insecure’, and 7 million suffering severe food insecurity, ie close to starvation. Another aspect of the blockade is the control of Yemeni airspace by the Saudi regime: no flights in or out of Yemen can take place without prior clearance from the Saudi military and most have a stopover in Bisha where Saudi forces check on all passengers and cargo; so while there are flights in and out of Aden, Mukalla and Seiyun in the south, Sana’a airport has been closed for weeks. Even UN flights were forbidden for a whole week when the Huthi-Saleh alliance re-called Parliament to approve their new Political Council. Preventing members from returning to Sana’a was intended to ensure the meeting would be inquorate, but this tactic failed. Although UN flights and other humanitarian flights travel on a case by case basis, members of the Sana’a delegation to Kuwait have now been stranded in Muscat for almost a month, as the UN has been unable to guarantee their safe return to Sana’a, something which does little to improve confidence in the UN’s mediation role or its credibility. A third form the war is taking now is the attempt by the ‘legitimate’ government to prevent the Central Bank from functioning. A third form the war is taking now is the attempt by the ‘legitimate’ government to prevent the Central Bank from functioning. Having successfully remained neutral, the Central Bank of Yemen somehow managed to continue paying salaries to civil servants and military personnel on all sides throughout the war, despite its reserves having collapsed from USD 5 billion to less than USD 1 billion in the last 12 months. Without addressing the issue of where these funds came from, this has been quite an achievement. The Hadi government has recently been trying to relocate the bank to Aden and replace its senior officials. Even the regime’s international supporters such as the US and UK have expressed concern at this move and, to date, the IMF and other financial institutions have ignored it. If implemented, its main consequence would clearly be a dramatic worsening of the food and fuel situation within the country, in other words, more hunger, starvation and death, given that importers are already facing extreme difficulties in obtaining the letters of credit they need to import basic commodities and emigrants also face many hurdles in sending remittances to help their families. In conclusion, the meeting on 25 August in Jeddah bringing together US Secretary of State Kerry, UK’s Ellwood, UN envoy Ismail with the foreign ministers of Saudi Arabia and the GCC, was intended to re-launch talks. While rumours of a new initiative have circulated, it would seem that they expressed hope rather than fact. The Hadi side continues to insist that the Huthi-Saleh forces must first withdraw their forces from the cities and hand over their heavy weapons to an undefined and unknown neutral ‘third party’, something which the Huthi-Saleh side consider equivalent to surrender and which fails to recognise their actual control of much of the country’s area and most of its population. They demand that a consensus government be formed prior to any military withdrawal. While Kerry’s statement hinted that the two might happen simultaneously, this issue has not been addressed adequately. The UN SC meeting on August 31 also failed to produce anything meaningful and the UN special envoy is back on his travels, which may help the Huthi-Saleh delegation to get home. Meanwhile bombing and fighting continue, more people are killed and wounded, more are hungry and suffer from preventable diseases and lack treatment, and there are increasingly critical articles in various international media…. Just in case this had escaped your attention, Saleh was the autocratic leader forced to quit in early 2012 as a result of the mass demonstrations throughout 2011 which brought about the Gulf Cooperation Council Agreement in November 2011.